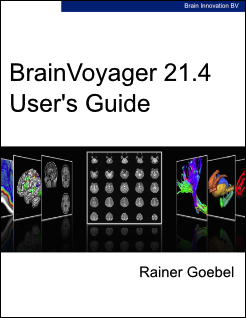 The "BrainVoyager User's Guide" provides an in-depth explanation of all major features of the software. It is available from BrainVoyager by clicking on the “User’s Guide” icon in the main toolbar or by clicking the "User's Guide" item in the "Help" menu. The link below provides an e-book version of the User's Guide that allows convenient reading on mobile and desktop devices supporting the EPUB 3 format. After downloading, add the e-book to your standard e-book reader such as iBooks on (mobile and desktop) Apple devices or Google Play Books on Android. On Windows 10, e-books are opened e.g. in the Microsoft Edge Internet browser. 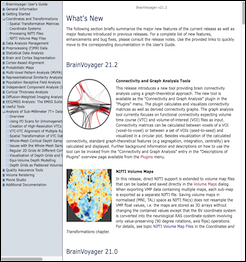 The papers below may be helpful to get a general overview of standard as well as advanced features of BrainVoyager. "BrainVoyager [version number] (Brain Innovation, Maastricht, The Netherlands) was used for fMRI [DTI / EEG / MEG] data analysis (Goebel et. al., 2006)." 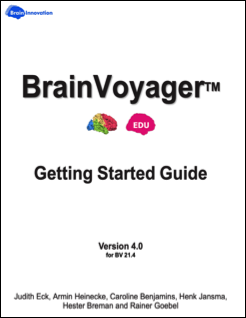 We recommend that users new to BrainVoyager start with working through the Getting Started Guide (GSG) to learn about the most important basic analysis tools. To download the GSG, click on the link below. If you can not open the PDF file, download the free Acrobat Reader. The Getting Started Guide 3.0 describes tools as they are available in BrainVoyager 21.0. Goebel, R., Esposito, F. Formisano, E. (2006). Analysis of functional image analysis contest (FIAC) data with Brainvoyager QX: From single-subject to cortically aligned group general linear model analysis and self-organizing group independent component analysis. Human Brain Mapping, 27, 392-401. For citing relevant papers on specific methods (e.g. Granger Causality, ICA, Cortical Thickness Analysis, (functional) CBA, SVM, searchlight, TMS, EEG/MEG), consult the Publications page. 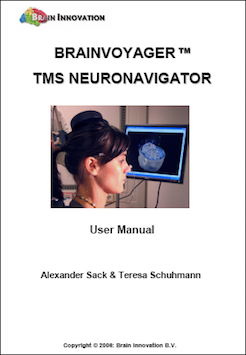 To view or download the BrainVoyager TMS Neuronavigator User Manual, use the link below. Depending on your Internet browser, a simple click on the link will most likely open the guide in the browser window. If you can not open the PDF file, download the free Acrobat Reader. For saving the file to disk, a "Save to disk..." or similar option is usually available in a context menu. If you have any questions about documentation not answered here, please send an email to support at BrainVoyager dot com.